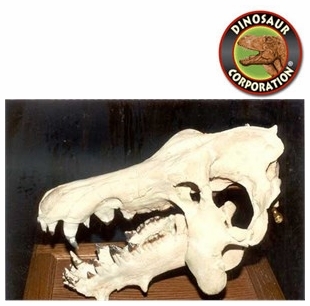 Archaeotherium Skull. Mammal Fossil Replica. Oliogocene entelodont, a pig-like artiodactyl of the White River Formation, South Dakota. Archaeotherium is an extinct genus of entelodont artiodactyl found in North Dakota during the Eocene and Oligocene epochs (38�24.8 mya), existing for approximately 6 million years. Archaeotherium was about 1.2 meters tall at the shoulder and around 2 meters long and weighing around 270kg. Found in South Dakota, Nebraska, and Wyoming.